If you have any questions that are not answered on this page, please do not hesitate to contact info@pinkcatstudio.com. Who do I contact for Customer Sevice questions? If you have any questions, suggestions or need help, please do not hesitate to contact us at info@pinkcatstudio.com and we will get back to very soon. Why is touch or drag and drop not working on my SMART Board or interactive whiteboard? In the Chrome browser, enter chrome://flags/#touch-events in the address bar. Browse to Touch Events API. Select Enabled in the drop-down menu. Close the Chrome browser, be sure all instances of Chrome are closed. Disconnect your interactive whiteboard from your computer. Restart your computer and then connect your interactive whiteboard. Then open Chrome, only after you have connected your interactive whiteboard to your computer. If Chrome still doesn't work with touch, please try using Microsoft Edge if you have a PC or Safari if you have a Mac. How can I offer suggestions to make the website better? We welcome all suggestions! Please email us with your ideas or requests at info@pinkcatstudio.com. We’d love to hear suggestions for how to make the website work better for your classroom needs. Or if you have a request for a type of game, clip art pictures, audio words or anything else, please don’t hesitate to contact us! Why are you changing the format of your games from downloadable Flash format to an online website? The games will work on any device including tablets, computer and interactive whiteboards. Game settings can be saved so that you can quickly play a game again in the future. 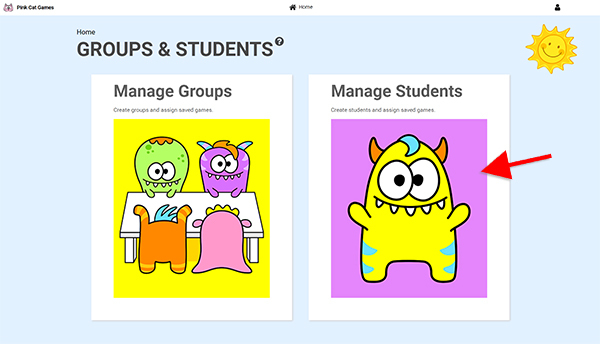 You can save games and assign them to groups and students for easy play at centers. You can add pictures to questions in Quiz-E games. The downloadable games can only accept text based questions. 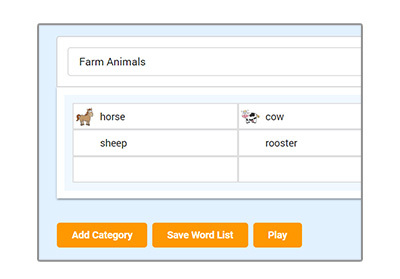 Many games will have a 'say the word' option to read a word to a student. This was not possible in the downloadable games. It is much easier to get started playing as there is no unzipping and installing required. The downloadable games were difficult to open for some people as unzipping and enabling Flash were often required and were sometimes confusing. Flash will soon no longer be supported by browsers as the new HTML5 format has become the standard. Our new HTML5 games are keeping up with technology. Will the downloadable games that I have purchased on TPT be available on this website? Yes, in time. Our plan is to convert most of our existing games that we have sold on TPT for years, and make them available to play on the website. It will take time to convert them all to this new format but they will get here in the not to distant future. If you have purchased a game on TPT, you will be able to add it to your account on this website once it is converted to the new format. The added benefit of the website format is that the games are playable on any device. 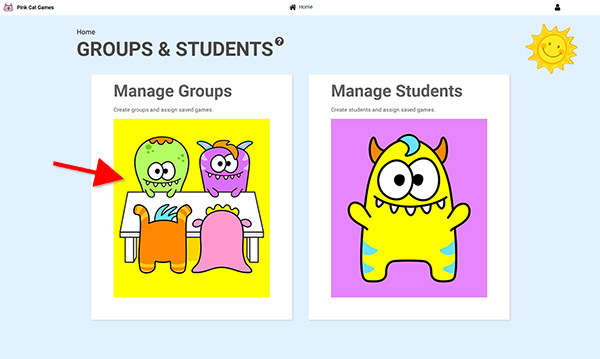 As well you can save settings and assign games to groups and students. These features were not possible with our downloadable games. How do I access a game that I purchased from Teachers Pay Teachers? Get the Order ID and the Item ID from your TPT Invoice. Log in to your Pink Cat Games account or create a new account. Add the item that you purchased to your Pink Cat Games account. Step 1 – Get the Order ID and Item ID from your TPT Invoice. Log in to the Teachers Pay Teachers website. Click on your name in the top right corner and then choose My Purchases. Find the game in the list of your purchases. Click on the words Printable Receipt to see your receipt. Your receipt will look similar to this picture. Take note of your Order ID and Item ID. Step 2 – Log in to the Pink Cat Games website and enter your purchase details. You will see a thank you page that asks you to log in or create a new account. 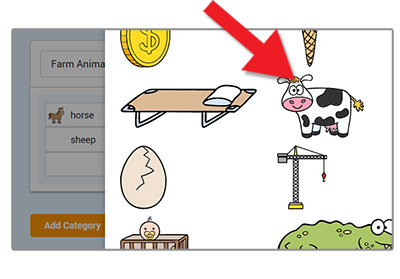 If you do not already have a Pink Cat Games account, click on the Create Account button. It only takes a minute to create an account. Step 3 – Add the item that you purchased to your Pink Cat Games account. On the Add a Product page, enter the Order ID and the Item ID from your TPT invoice. If you have purchased multiple licenses, each person should create their own account on PinkCatGames.com and then each person should add the product to their account using the same Order ID and Item ID that is on the TPT invoice. After the product is added, you can find it on your My Purchases page. Simply click on the game picture to play the game. How do I add a purchase where I have bought multiple licenses for my colleauges? 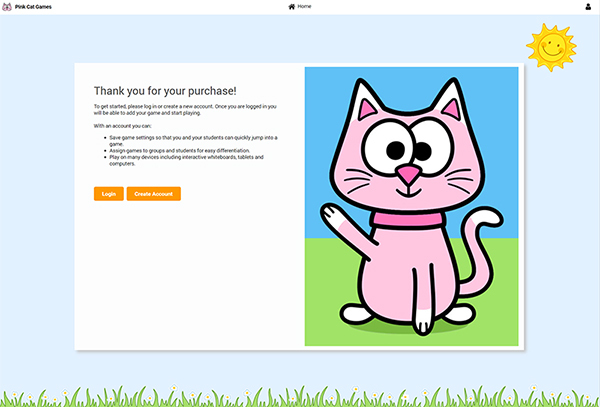 If you have purchased multiple licenses for a game or subscription, each person should create their own account on PinkCatGames.com and then each person should add the product to their account using the same Order ID and Item ID that is on the TPT invoice. Have each person follow the steps outlined in the answer to the question "How do I access a game that I purchased from Teachers Pay Teachers?". What are the benefits of having a subscription? The main benefit of a subscription is that you will have access to all current games on the website as well as new games as we add them. Our plan is to continuously be building new games. With each game you can choose from hundreds of already created question sets or make your own for the exact skill that you would like to practice. A subscription can be purchased through our Teachers Pay Teachers store at https://www.teacherspayteachers.com/Store/Pink-Cat-Studio/Search:pcg. How can I purchase a subscription or individual games? 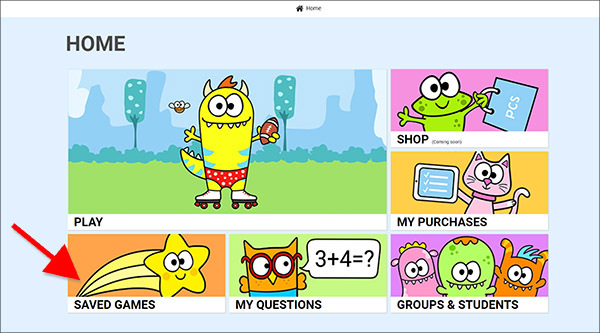 We sell our games and subscriptions in our Teachers Pay Teachers store at https://www.teacherspayteachers.com/Store/Pink-Cat-Studio/Search:pcg. How do I save game settings? Saving game settings will allow you to quickly start the game without having to choose any settings. 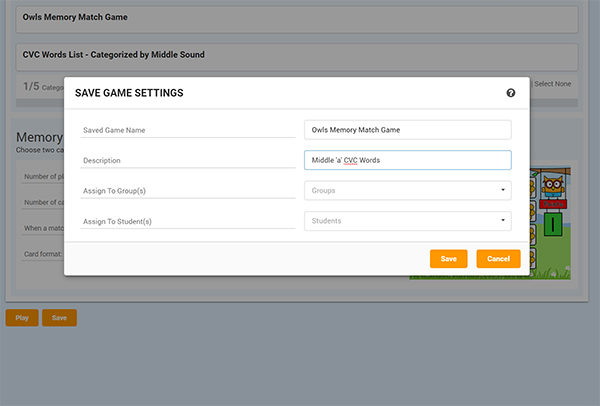 As well, you can assign saved games to groups and individual students. First, choose the settings for your game. 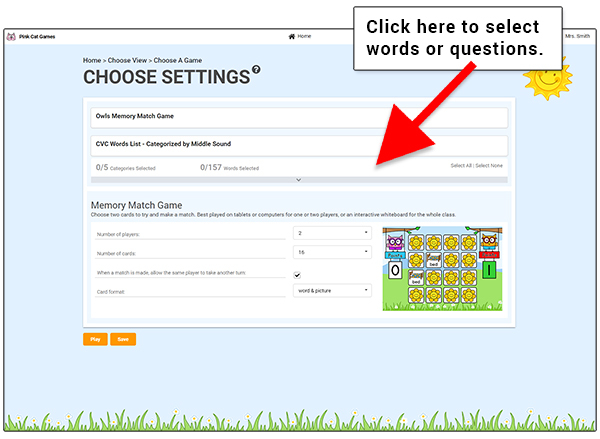 Click on the words/questions drop down to choose the content for your game. 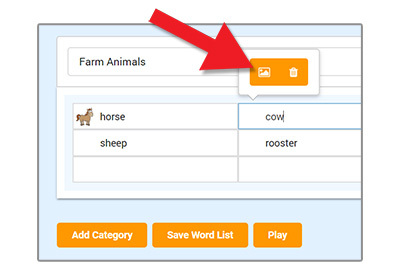 You can click 'Select All' to choose all words from a category or click on individual words to include or exclude them from the game. Next, choose settings for the game options such as number of players and length of time to play. Finally, click the Save button to save your game. The Save Game Settings popup will appear. Enter a name and description for your game. I have chosen only words with a middle 'a' vowel so I wrote that in the game description. You can also quickly assign the game to students or groups if you have already set them up. Click the Save button to save the game. To find your saved game at a later date, go to the Home page and click on Saved Games. 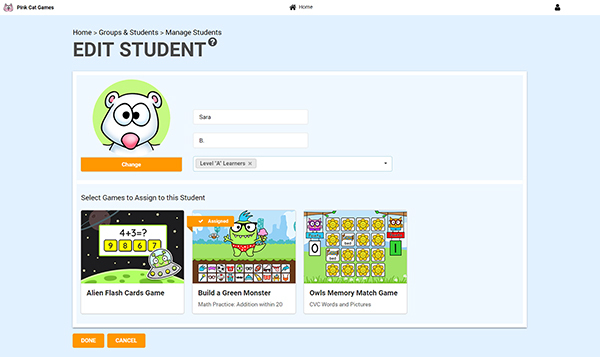 For games to appear in the Student View, you must assign games to either Groups or Students. 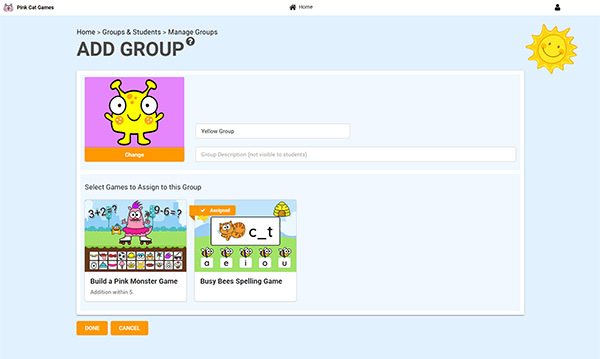 To create groups and students and assign saved games to them, go to the Groups and Students page. How do I modify the settings in a saved game? From the Home page, click on Saved Games. Choose Teacher View. At the bottom of a saved game card you will see an edit and a delete button. Click on the edit button. This will open the game settings page where you can pick new settings and then save them. You can also make a copy of the saved game with different settings by changing the settings and then clicking the Copy button. How do I delete a saved game? Click on the delete button to delete the saved game. If the game was assigned to any groups or students, it will no longer be available to them. How do I make a copy of a saved game? Click on the edit button. This will open the settings page for the game. Change the settings if you wish and then click on the Copy button. Give the game a new title and choose any assignments for Groups and Students and then click the Save button. How do I create groups and assign games to them? From the Home page, choose Groups & Students. Click on Manage Groups. Click on the Add Group button. Type in a name for the group and an optional description. The description will not be shown in the Student View. All saved games that you have created will show up here. Click on any saved games to assign/unassign them to this group. Click DONE when you are finsihed. You will be taken back to the Manage Groups page where you can see all of the groups that you have created. After you have created a group, you can assign a saved game to the group when you are saving the game. Choose a game and then select your game settings. Click on the Save button and the Save Game Setting pop up will appear. Create a name and optional description for the saved game and then choose any groups that you would like to assign the game to. How do I create students and assign games to them? From the Home page, choose Groups & Students. Click on Manage Students. Type in the names of your students. If you have already created groups, you can assign the students to groups using the Assigned Groups drop down in the column beside Last Name. You can change the image that is assigned to each student by clicking on it and choosing a new image. Click the Save button to save your student list. 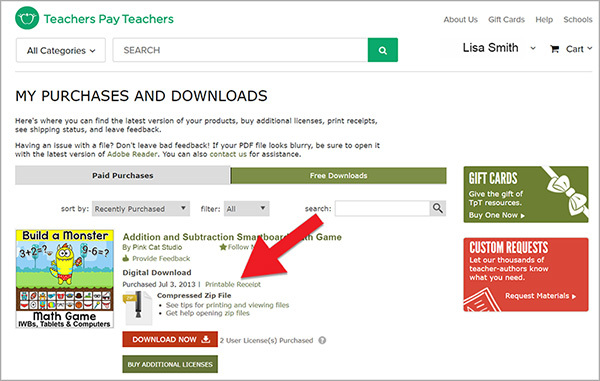 If you have already created some saved games that you would like to assign directly to a student, click on the edit button that pops up when you select a row. On the edit page you can assign saved games to a student. Click on a saved game to assign/unassign it to the student. Click Done when you are finished to save your changes. After you have created students, you can assign a saved game to them when you are saving the game. Create a name and optional description for the saved game and then choose any students that you would like to assign the game to. How to set up tablets and computers for students to play independently? Option 1: Share a link to the Student View. Click on ‘SAVED GAMES’ from the home page. You will see a sharable "Student Link" that you can send to students and parents. This link allows students to access their games from any device. You can distribute the link through email, Google Classroom, or whichever classroom management software you use. Option 2: Log in to your teacher account on the device and then go to the Student View. Click on ‘SAVED GAMES’ and then ‘STUDENT VIEW’. 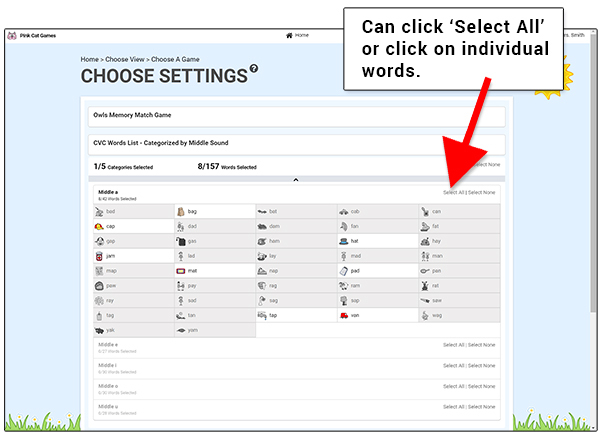 Once you are in the student view, the device will stay logged in to the Student View. 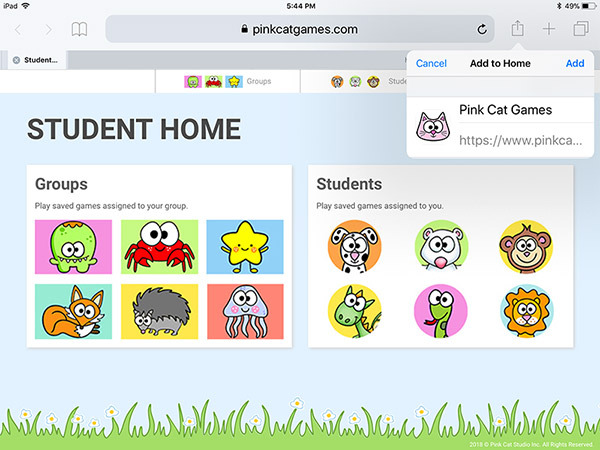 If the browser is closed or the device rebooted, the student view will still be active when you come back to pinkcatgames.com so you won’t have to ever enter your log in information again. Although you logged in with your teacher account, once the device is in the Student View, you are then logged out from the Teacher View so that your teacher setup pages and account information cannot be accessed by the student. How do I make my own questions? From the Home page, choose My Questions. Click on the Create Questions panel. Choose to make either a Multiple Choice question set or a Word List. 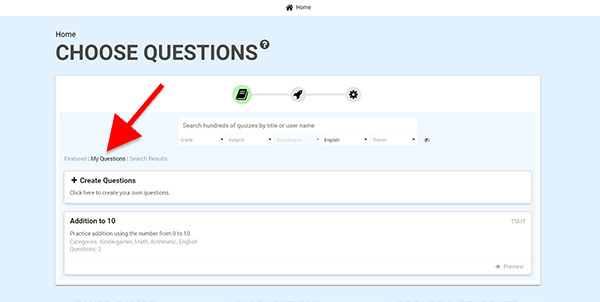 Use the question editor to make as many questions as you would like for your question set. Be sure to click the Save button before leaving the page. To play a game with the questions you have made, go Home and click on Play. 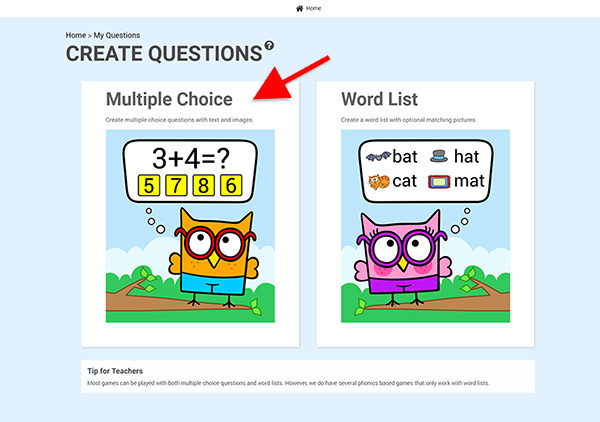 Click on the My Questions filter to see the question sets that you have created. Click on your questions to use them in a game. How do I add “say the word” functionality to my question sets or word lists? The “say the word” option in games happens automatically when an English word in a word list or answer matches a word that we have in our audio library. This feature does not work for sentences or multiple words. For example, if the word in the word list is “cat” and there is an audio file for “cat” then the “say the word” audio button will appear in a game. If the word was “the cat”, the ‘say the word‘ audio button would not appear in the game because there are two words. The same holds true for multiple choices questions and answers. If a question or an answer is just one word, and that word exists in our audio library, then the ‘say the word’ audio button will appear in a game. Currently the audio library contains over 800 English words. If you have a request for specific words to add to the library, please email info@pinkcatstudio.com with the subject ‘Audio Request’ and we will add your suggestions to our list. How do I add pictures to words in a word list? In the word list editor, click on a word that you have typed in and a little popup menu should appear with a picture icon and a delete icon. Click on the picture icon. A grid of images will appear. Click on an image. The image will now be associated with your word. Can I import my Quiz-E quizzes that I made using the downloadable Quiz-E games? Open your quiz in the Quiz-E Quiz Creator program. Log in to the Pink Cat Games website and click on MY QUESTIONS. 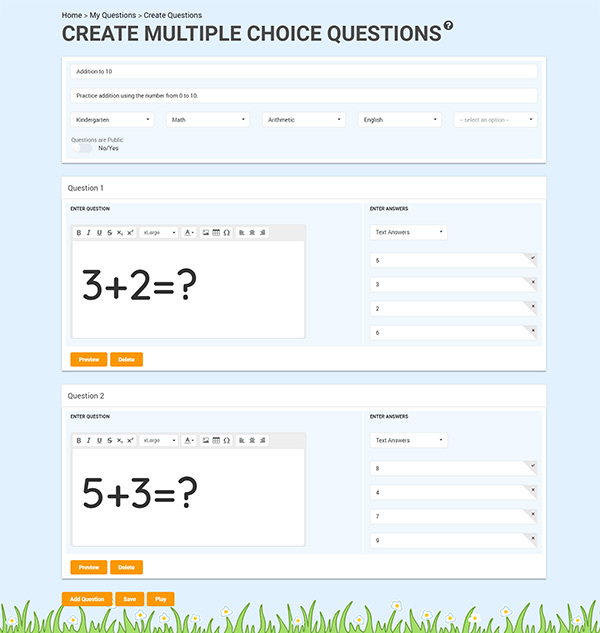 Click on Create Questions and then choose Multiple Choice. Fill in the name and description for your question set and then add a new question. Go to the Quiz-E Quiz Creator and copy the question text and then paste it into the website question. Do this for every question and you will quickly have recreated your quiz. How do I play a game on an interactive whiteboard? Playing a game on an interactive whiteboard is easy. Run the game on the Pink Cat Games website and then project your screen onto your whiteboard. How to set up tablets and computers for students to play independently ? How to create a shortcut icon on the home screen for an iPad or iPhone. 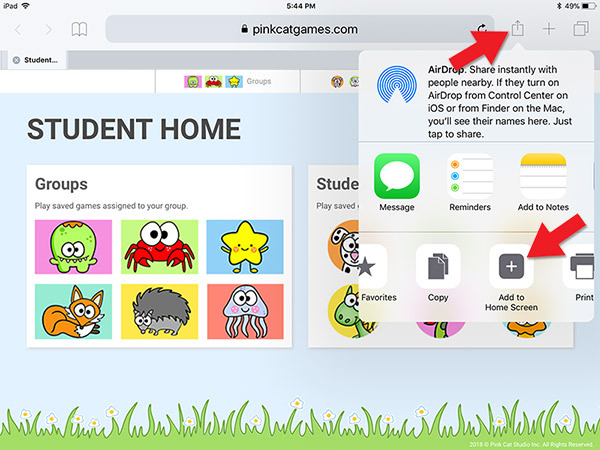 Step 1: Open Safari on your iPad or iPhone and enter the Student Link that can be found on the Saved Games page. This will take you to the webpage that your students will use at both school and at home to play their games. Step 2: Tap the “share” button on your browser’s toolbar (it’s the rectangle with an arrow pointing up.) You will find this at the top of an iPad screen and at the bottom of an iPhone screen. A menu will appear. Look for and tap on the “Add to Home Screen” icon. You may need to swipe the black and white icons to show more icons. Step 3: Tap the “Add” button and the shortcut app icon will be added to your home screen. You can drag the icon around and place it anywhere, just like your other app icons. How to create a desktop shortcut on a Mac computer. Step 1: Open Safari on a Mac computer and enter the Student Link that can be found on the Saved Games page. 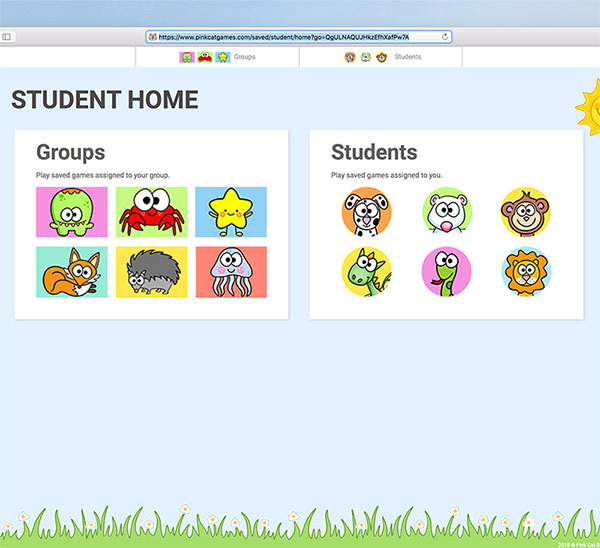 This will take you to the webpage that your students will use at both school and at home to play their games. Step 2: Select the entire address in the address bar at the top of the browser. Step 3: Click and drag the address onto the Mac desktop and release the mouse button. 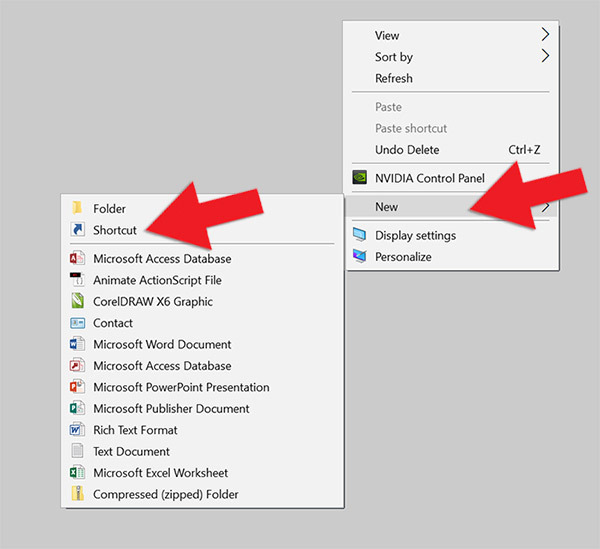 Step 4: A shortcut icon pointing to the game webpage will be created on the desktop. 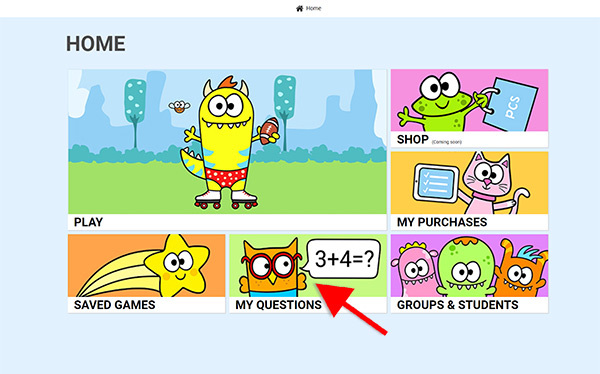 Your student can double click on the icon to easily get to their games. 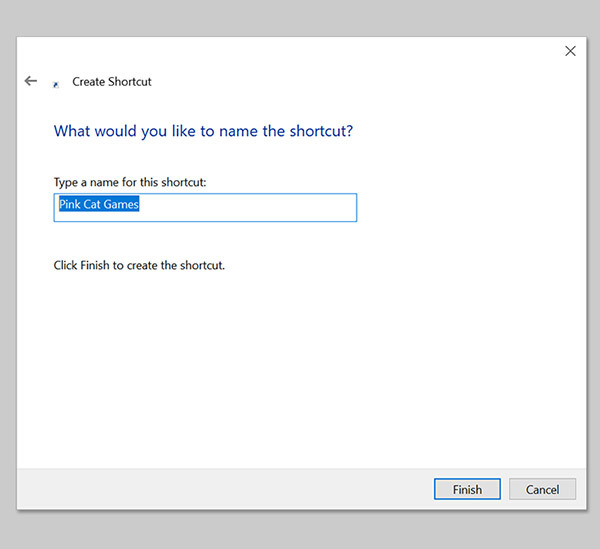 How to create a desktop shortcut on a Windows computer. 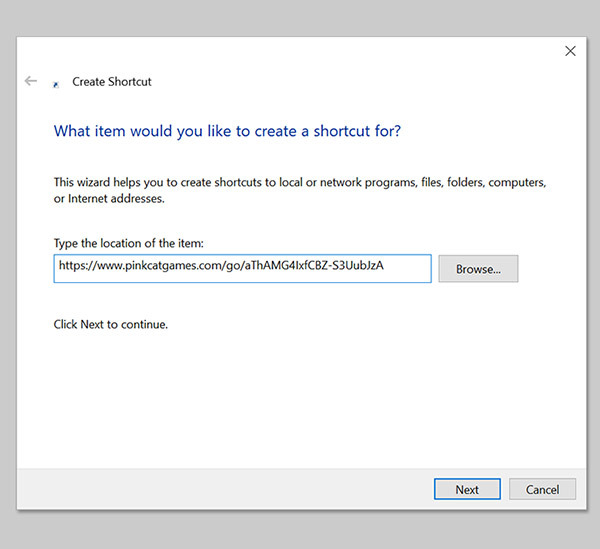 Step 1: Right click on your desktop and choose “New” and then “Shortcut”. 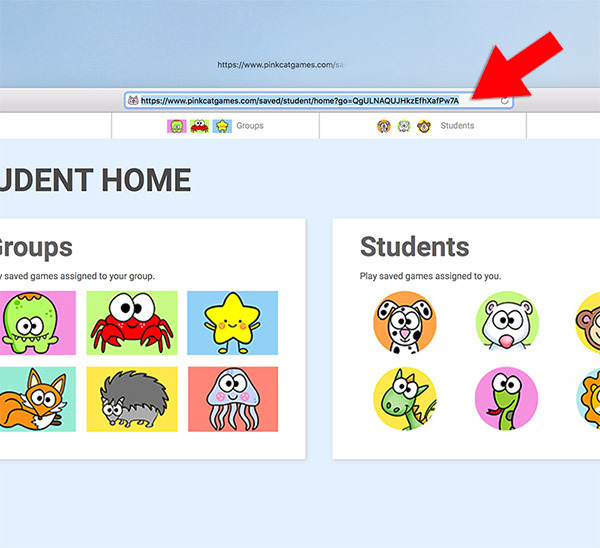 Step 2: Enter the Student Link that can be found on the Saved Games page and then click the “Next” button. Step 3: Give the shortcut a name such as Pink Cat Games or something that your student will easily recognize and then click the “Finish” button. The shortcut icon will now appear on your desktop. 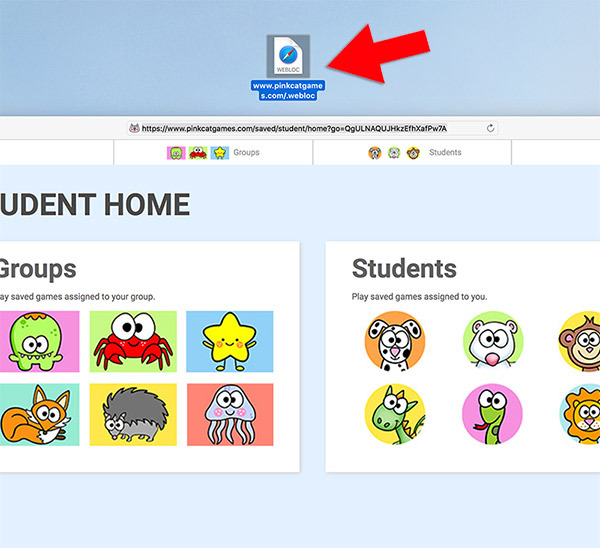 Your students can double click on the icon to easily get to their games.